This design is the perfect “Together ” Not too big, not too small - ideal for a bed side table! 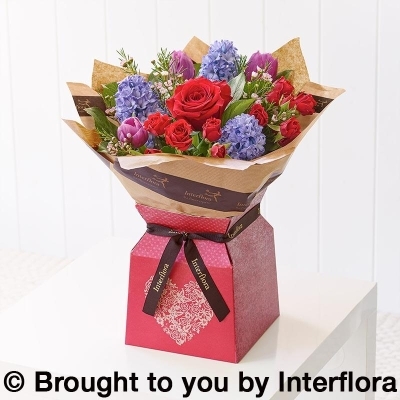 Featuring a large ruby red Freedom rose, blue hyacinths, red spray roses, purple tulips, pink waxflower and salal tips foliage for added texture. Hand crafted in our florist shop, we carefully wrap and trim with luxury ribbon and present in a pretty heart design gift box. Sweet, delicate and simple. This design is perfect for a small gift, sent with big love. 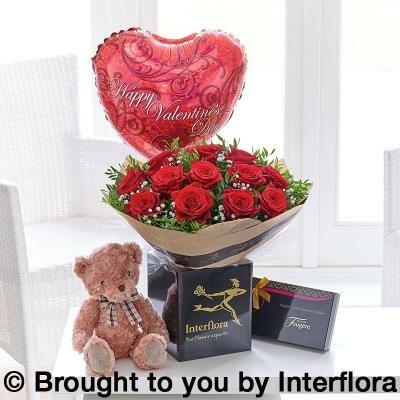 Our artistic Always Gift box is designed to show true romance and passion for Valentine’s Day. This pretty floral bouquet is created using 6 of the finest Freedom red roses, pink waxflower, and complimented with green pittosporum and salal tips. Freedom roses are stunning luxury red roses, which are chosen for romantic Valentine’s bouquets for their high petal count, rich ruby red shade and beautiful shape. 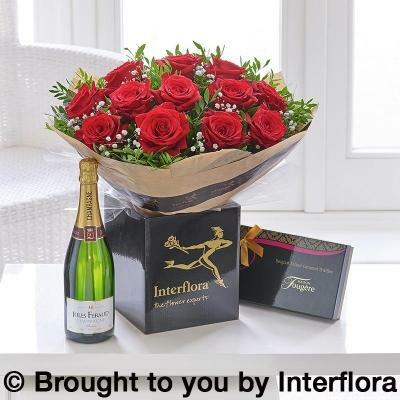 Sending 6 red roses has a meaning behind it, the very romantic message of ‘I want to be yours’. Every Always Gift Box is carefully hand created by our expert florist team, carefully wrapped and presented in a beautiful gift box and tied with luxury ribbon. Keep it simple with a single red rose entwined with scented spring flowers, in shades of reds, blues and hot pinks! Be moonstruck with this love vase. Our Moonstruck Love Vase is the perfect stylish alternative this February. Skilled florists will hand create this beautiful arrangement using red Freedom rose, blue hyacinths, cerise alstroemeria, cerise germini and purple tulips. To compliment these bold, romantic shades we add pistache and salal foliage for texture and deep green tones. 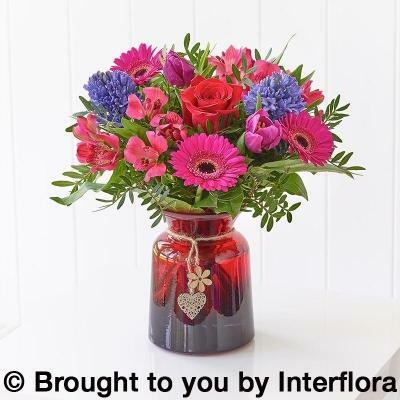 The flowers are lovingly arranged in a ruby red glass vase and trimmed with a flower and heart tag. The delicate white blossoms represent honesty, purity and perfection. Nothing stands out more than pure class! Our Deeply Devoted hand-tied bouquet has been expertly designed to add a touch of magical elegance this Valentine’s Day. 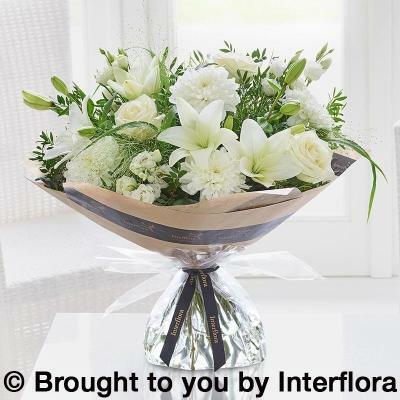 This eye-catching elegant flower bouquet features large headed white roses, white lilies, white chrysanthemum and white lisianthus. We also add panicum grass, pistache and salal foliage to add beautiful natural texture to the bouquet. Our skilled florists hand-tie the stems and luxuriously wrap and finish with ribbon. This hot design of rich reds and pinks emphasises romance! Why choose one colour when you can have two? A striking mix of rich red and pretty pinks flower shades makes our Dramatic Mixed hand-tied the perfect gift to make someone go ‘wow’ this Valentine’s Day. 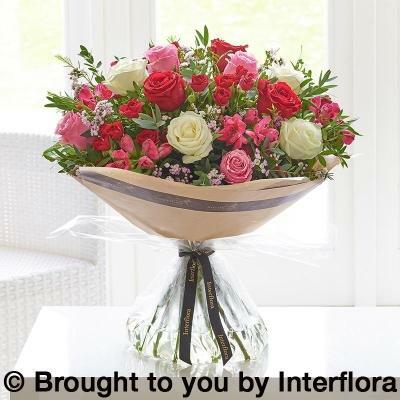 Our skilled florist team use a selection of the finest stems including large headed red Freedom roses, pink roses and pink waxflower to lovingly hand-tie this bouquet. We also add thlaspi, pistache and salal foliage for added texture, and finish with luxury wrap and ribbon. The delicate white rose creates a startling bouquet. Their pure colour conveys respect, pays homage to new starts and expresses hope for the future. 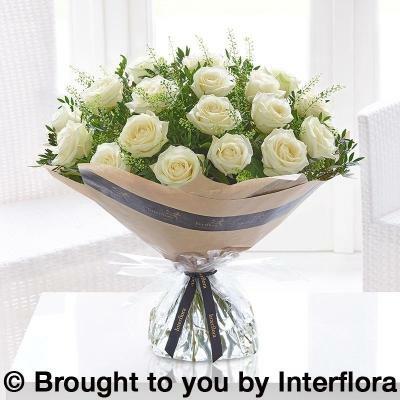 Our beautiful dramatic white roses hand-tied bouquet is the perfect elegant gift this Valentine’s Day. White roses have a beautiful meaning behind them symbolising hope, innocence and new beginnings. Our expert florists use stunning Avalanche white roses, which are hand-tied in store with thlaspi, pistache and salal foliage to add striking texture and lush greenery to the bouquet. We finish with luxury wrap and ribbon, ensuring a beautifully presented gift for the one you love this February. Dramatic, passionate and the symbol of true love. The red rose is a classic “I love you” rose, making it a popular choice for Valentine’s Day. 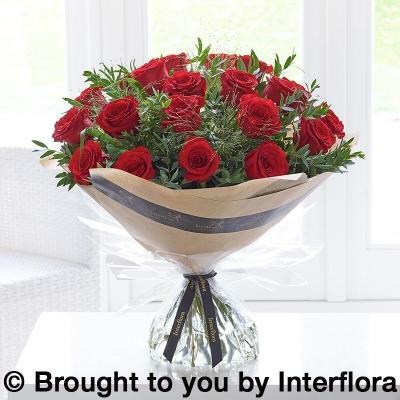 Our florists carefully hand create every Dramatic Rose bouquet, using the finest Freedom red roses. Freedom roses are stunning luxury red roses, which are chosen for romantic Valentine’s bouquets for their high petal count, rich ruby red shade and beautiful shape. To perfectly compliment the striking ruby red Freedom roses we add white gypsopholia, pistache foliage and salal tips for texture. Each hand-tied bouquet is hand-tied, lovingly wrapped and presented in our gift bag. One for all! Spice things up with this romantic mix of colours, ideal for expressing your true love. Guaranteed brownie points for being different! Using seasonal flowers in beautiful shades of rich red, pretty pinks and elegant creams, the Forever Hand-tied is luxurious bouquet to spoil someone special this February. 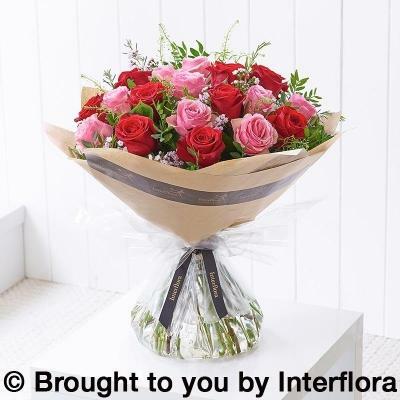 Our skilled florists use large headed red roses, large headed pink roses, large headed white roses, red spray roses, cerise alstroemeria and pink waxflower. We add eucalyptus, salal and pistache foliage for texture before carefully wrapping and hand tie ribbon for the perfect finishing touch. Show that special someone just how much you care this Valentine’s Day with our Dramatic Roses hand-tied bouquet. 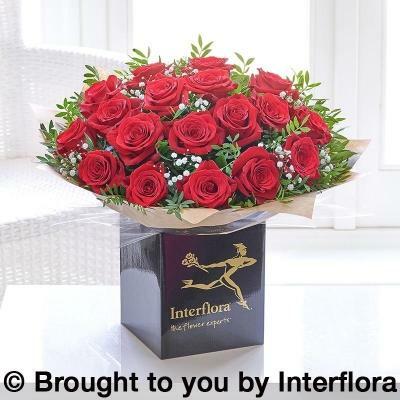 Our florists carefully hand create every Dramatic Rose bouquet, using the finest Freedom red roses. Freedom roses are stunning luxury red roses, which are chosen for romantic Valentine’s bouquets for their high petal count, rich ruby red shade and beautiful shape. To perfectly compliment the striking ruby red Freedom roses we add white gypsopholia, pistache foliage and salal tips for texture. Each hand-tied bouquet is hand-tied, lovingly wrapped and presented in our gift bag as a gift set. Send a wonderful fresh bouquet of 20 Red Roses to the queen of your heart. Because sometimes 12 just isn’t enough! 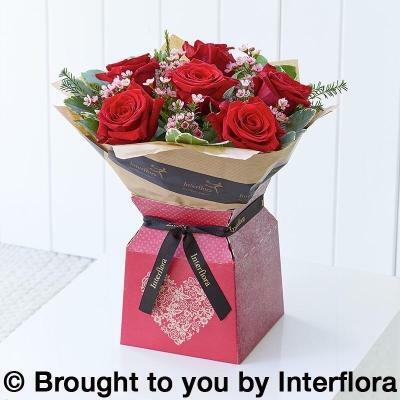 Make your true loves’ heart melt this Valentine’s Day by sending our stunning Heartfelt 20 red roses bouquet. Our talented florists lovingly hand create this bouquet using 20 high quality Freedom roses, which is perfectly complemented with eucalyptus and panicum fountain grass. Freedom roses are stunning luxury red roses, which are chosen for romantic Valentine’s bouquets for their high petal count, rich ruby red shade and beautiful shape. Sending roses has a beautiful sentiment behind them, conveying deep emotions of love, devotion and admiration. With a dozen red roses, chocolates and champagne, we can deliver your special someone the perfect romantic gift… Surprise them with high quality products for a love without limits! To perfectly compliment the striking ruby red Freedom roses we add white gypsopholia, pistache foliage and salal tips for texture. Each hand-tied bouquet is hand-tied, lovingly wrapped and presented in our gift bag. Comes with champagne and chocolates. You will most definitely get the heart race going with this “50 shades” of red roses! Passionate, bold and desired to be noticed. Ensure your Valentine never forgets February 14th 2019 by sending 50 red roses to show your love. 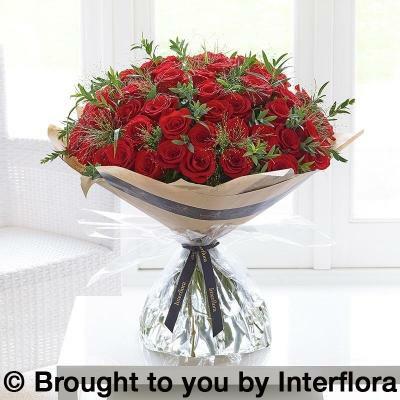 Our expert florists carefully hand create every bouquet, using the finest Freedom red roses. Freedom roses are stunning luxury red roses, which are chosen for romantic Valentine’s bouquets for their high petal count, rich ruby red shade and beautiful shape. To finish this stunning romantic bouquet, we carefully wrap and tie with a luxury ribbon. 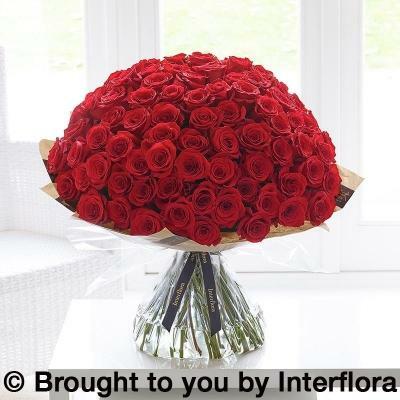 Say “I Love You” with 100 passionate kisses with 100 red roses! The ultimate declaration of true love and devotion. A message of love unfurls with every petal in this gorgeous bouquet. A timeless favourite! Our Ultimate 100 Rose hand-tied is lovingly hand crafted by our expert florists, using the finest Freedom roses. Freedom roses are the rose of choice this Valentine’s due to their pure luxury look, ruby red colour and beautiful shape. Sending roses has a beautiful sentiment behind them, conveying deep emotions of love, devotion and admiration. To finish this stunning bouquet, we carefully wrap in luxury paper and tie with a special ribbon.